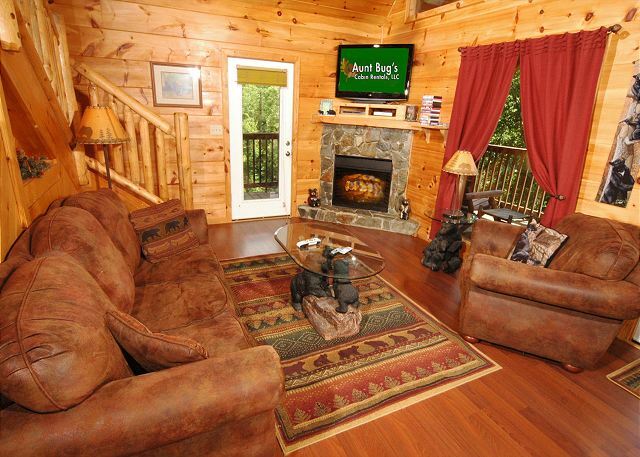 Bear Haven is an incredible mountain cabin fully equipped for the ultimate vacation experience! 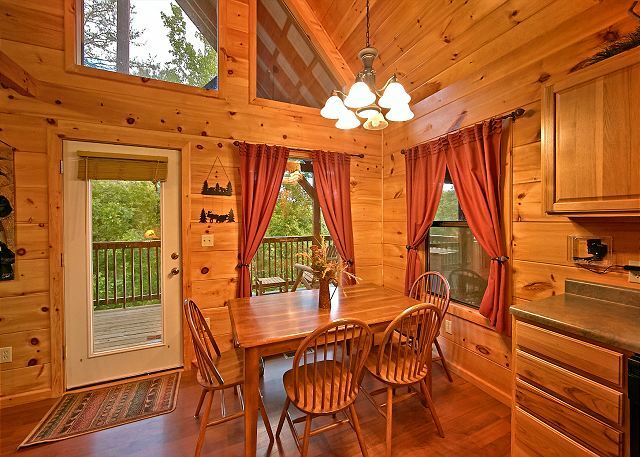 Enjoy a relaxing getaway in this beautiful Smoky... VIEW NOW. 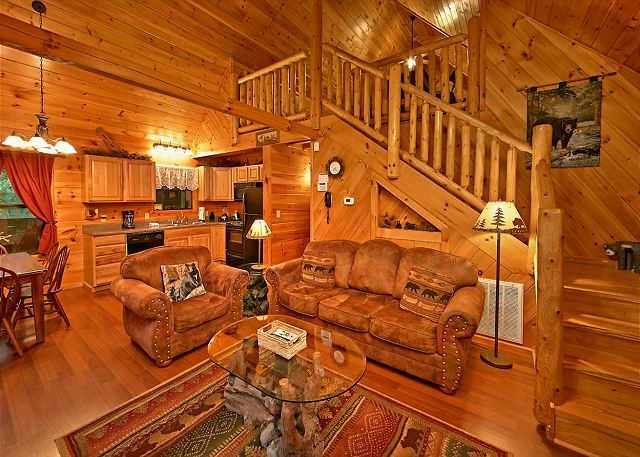 Location: Birds Creek Resort just 7 miles East of Pigeon Forge, TN. 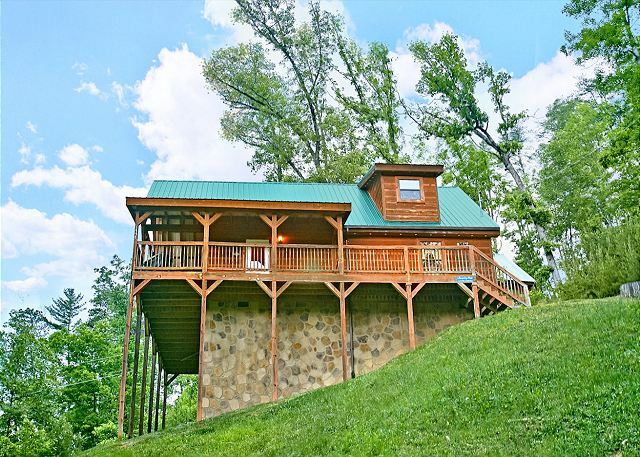 This incredible cabin located off of Bird's Creek is just minutes from Dollywood, Pigeon Forge, Gatlinburg and the Arts and Crafts Community. 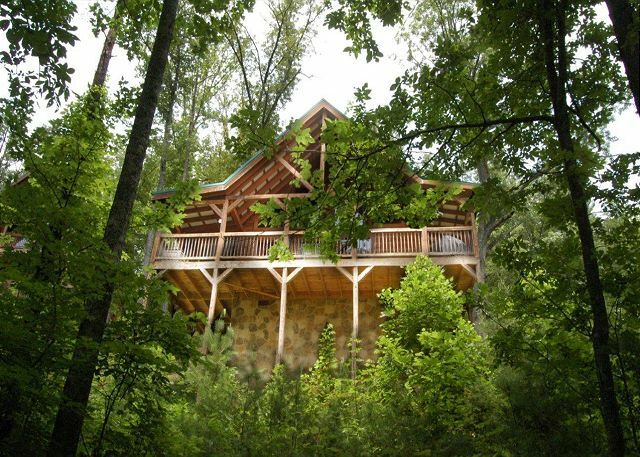 This cabin sits on over 1.5 acres of ground and offers seclusion and wooded beauty. 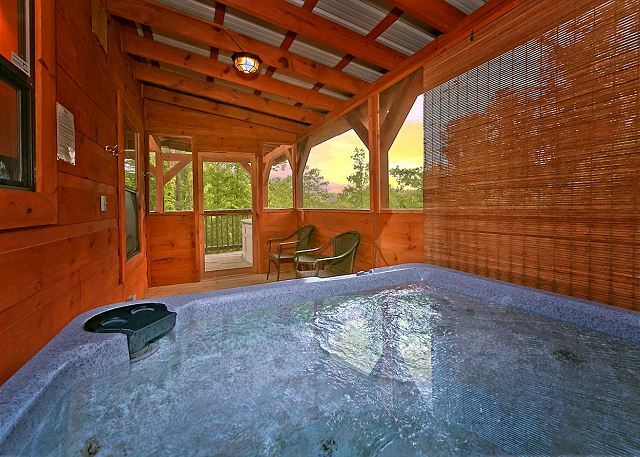 Relax in one of the few cabins in the area that has a screened in hot tub with sitting area. Cabin has a huge 2 person shower. 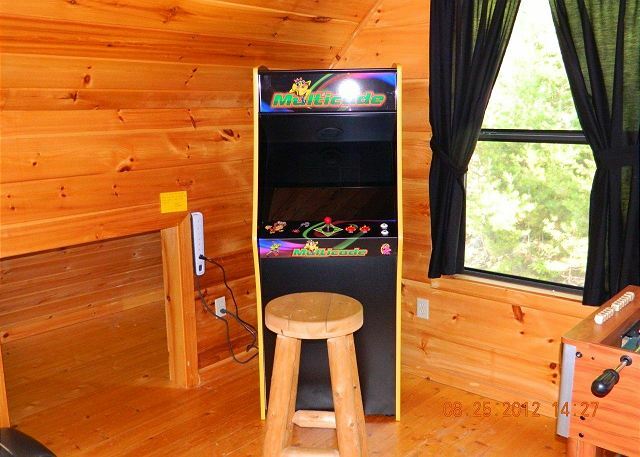 Relax on the wooden rocking chairs on the expanded wrap around deck with your favorite beverage while waiting for your food to finish on the grill, or eat out at the huge selection of restaurants nearby.Cabin now has new Multicade Arcade Game. Play all of your favorites. Watch your favorite movies, play pool, shop, soak in the hot tub or watch the sunset. Cabin has a paved driveway. This non-smoking cabin does not allow pets & has an alarm. Rates are based on 4 adults, each additional adult is $12.50 per night. We had a wonderful long weekend at A Bears Eye View cabin. Express check in was nice, cabin has a fun game room, and nice hot tub. It was very peaceful and just what we needed. Had an awesome experience from the first day we went online to find a cabin in he Smokeys. It was very easy to call Aunt Bugs, all our questions were answered, and they were just as friendly and accommodating when we arrived on Aug 11th for our week long stay! I wish I could have met the owner! The décor in our cabin was wonderful! It certainly lived up to its' name! The only thing different from all of our researching this rental was the view. 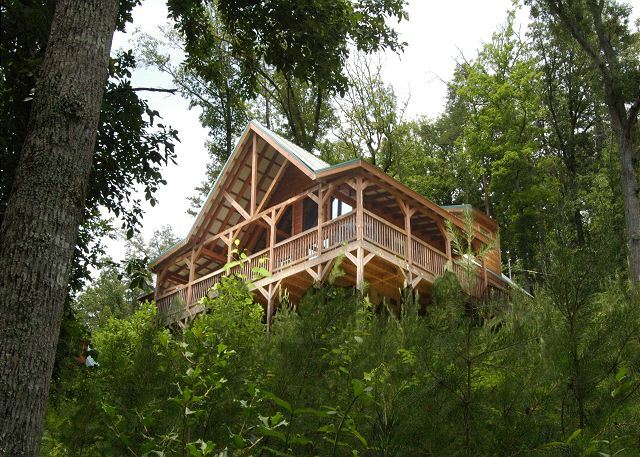 The trees around the cabin are about 40 feet taller than when the picture currently on the site was taken! Everything else was true to the pics! Will definitely rent from Aunt Bugs again! There is just too much to do in Tennessee in one week! We had a great time and it was a nice cabin. The only thing, was the view was blocked from all the trees, and the drive way is very steep and narrow. Great cabin! The owners put up Christmas decorations and it looked wonderful. We loved that the game room was upstairs (not enough games for toddlers though). The view is covered by trees, but its still beautiful. Hot tub was awesome, and the screened in porch is great for privacy. Cabin was very clean and everything worked fine. Only issues we had was a noisy fan in the main bedroom, and the outdoor light was out, including the motion detector ones. It was very dark, and since its pretty secluded, it was a little scary. There are a few cabins close, but its still secluded. The road leading to the cabin was VERY steep. We were glad it didn't snow. Overall, we loved it. It was a good experience up until the last night and there was a bachelor party right behind us, until 3am! We didn't get much sleep that last night! The beds were a little on the firm side but the set up of the house was great! The pool table and video game was our go to each night! All in all we got to see the area and that was the reason for the stay. We are looking for OUR future cabin! Second trip to TN. First trip stayed in Gatlinburg, this one in Pigeon Forge. Love me some Great Smokey Mountains! My boyfriend and I had a lovely, secluded weekend inside this cabin! Everything that we could’ve possibly asked for, was there! Although it was just the two of us, there was quite a bit more room for an entire family or additional couples. We will most assuredly be returning!!! Our stay was excellent. 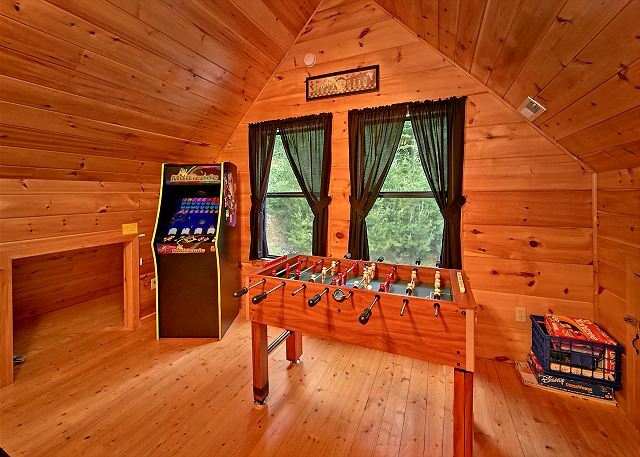 The cabin was beautiful and perfect for kids with the playroom. The driveway is very steep but worth it since you are high up on the mountain. My boyfriend and I and another couple just stayed at A Bear's Eye View at the beginning of August. We thoroughly enjoyed our stay. The full kitchen allowed us to cook at night and dine in. We also grilled a lot on the full size propane grill. We enjoyed the hot tub. The two bedrooms were very spacious. The 2 and a half baths were convenient. The only issue we had was our garbage receptacle wasn't emptied prior to our arrival so we had no where to keep our trash at first but that was quickly corrected by the staff after I called them to inform them of this. This was hands down a wonderful stay. There was also a pull out couch that could accommodate 2 more guests and a loft with a pool table, arcade game and just extra space. We will definitely be back! 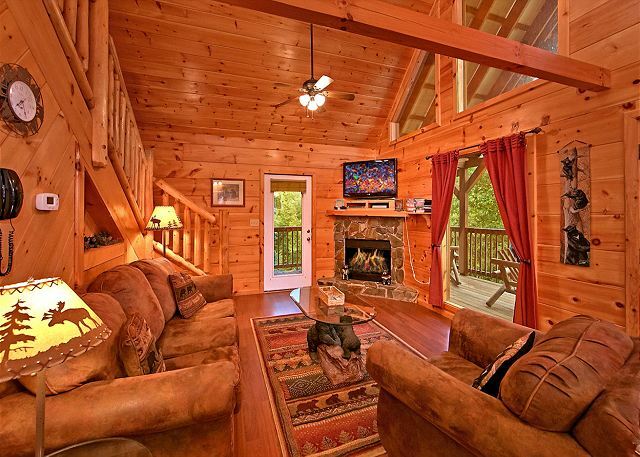 A Bear's Eye View is the perfect cabin for a family! Bedrooms are on the first floor and the game room loft has a 1/2 bath.Kitchen has plenty of utensils, pots/pans and even had a blender, hand mixer, toaster & coffee pot. Freezer makes ice so we didn't have to go buy any! It's those little things that make a difference. Only used the hot tub once, but it seemed to function fine and was comfortable. You do have 2 cabin to the right (when sitting on porch) of you, but the hot tub area is private with blinds & we had great neighbors during our stay and respectful (not loud). I really don't have anything negative to say about the cabin, other than the master shower was not cleaned well but easily resolved and the glider in the living room was broken (we just didn't use it). I highly recommend this cabin and rental company. Patricia was so helpful prior to our stay and when checking in, met staff that once lived back home near us. Small world. We will certainly rent again from Aunt Bugs! Thanks for the memories. We left with heavy hearts and are already planning our next adventure. The location was perfect, as was the house. It was exactly what we were looking for. Our three kids, ages 10, 11 & 13, didn't want to leave either. Check-in and check-out was flawless and fast. Thanks for the amazing memories! great time great time of year, only complaint it was over with much to quick. My husband and I had a wonderful vacation. 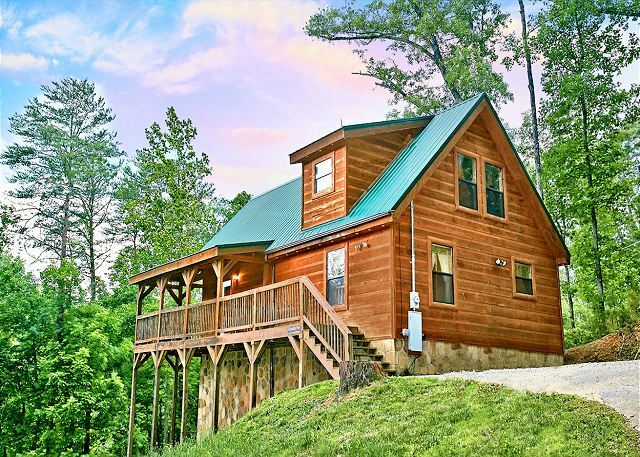 The cabin was everything the description provided and then some. We were very comfortable and the cabin was very clean. 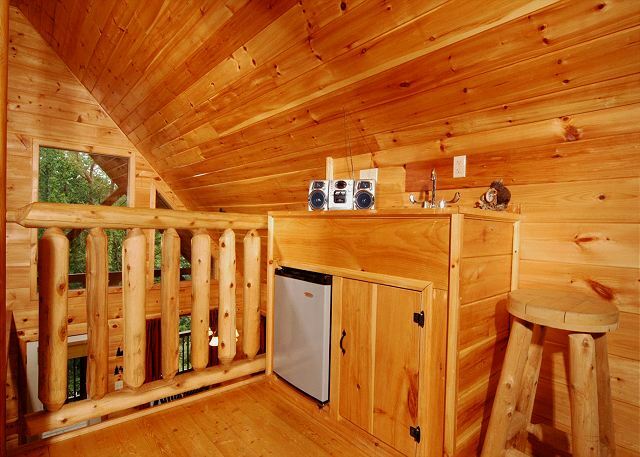 We really felt right at home in the Birds Eye View Cabin, and we will surely come back again. Thanks Aunt Bugs!!!! Our experience was great from the easy checkin to the even easier checkout. The cabin was absolutely perfect for our family of four. The location is great and semi secluded. Only 20-30 minutes to most attractions. 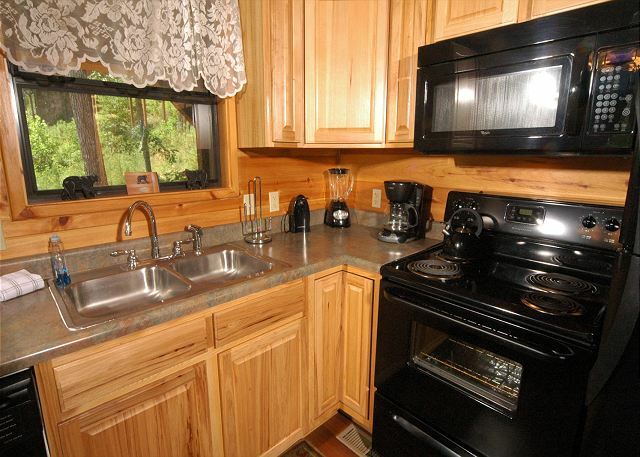 The kitchen is well stocked and the dining area is large enough to accommodate 6 people. The bedrooms are nice. The master bath has a huge double shower. The game room upstairs was really nice. Never a dull moment if you have to stay indoors! The hot tub was great. They even had it warmed up for us when we got there. 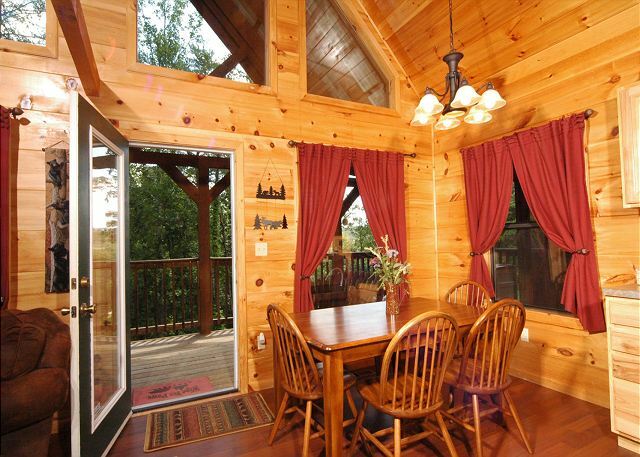 Overall we were extremely pleased and would recommend this cabin to anyone. The only thing I could even remotely say was bad is the driveway. It is incredibly steep. My 4X4 could make it but if it was icy it may have struggled. Besides that, the place is awesome! what we were looking for to have a relaxing stay. Everything was great except the mattress on the pull out couch. We had an awesome time, there was a couple of things broken like the DVD player and a pool cue. Also the stove spark while cooking breakfast on the second day and stop working. But the staff was polite and quickly fix the issues. We ended up staying one extra day because we really enjoy our time in this cabin. Beds are very comfortable, place was very clean. Pots and pans where included. Pool table and arcade was awesome to have. Hot tub was pretty good size, clean and warm. The location is great and very private. The parking is a little complicated. Beautiful view and quiet. Near everytown and a dollar store just in case you forget something lol. Overall we really enjoy the cabin a lot. 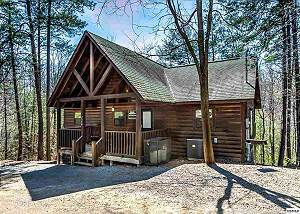 I would recommend this cabin for a family with kids. wonderful cabin. Nicely up in the mountains with spectacular views all around. Cabin was everything we expected. Clean and in great shape. Would stay here again on our next visit to the area. No problems whatsoever. Easy check-in. Our place was beautiful and clean. Easy to get around. Fairly nice view. 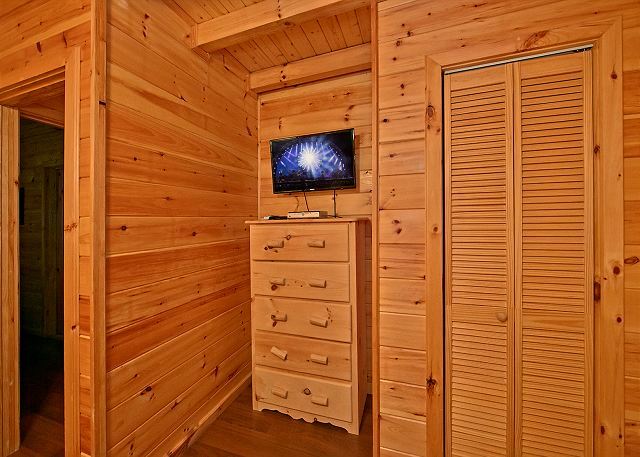 Pros: Super clean, exceptional little cabin with plenty of room, lots of towels, sheets, kitche3n extras, etc. Cons: Fooseball table had a broken leg, so it was unusable (they offered to send maintenance up to fix), driveway at about a 25 degree angle or more, king bed was creaky, but comfortable. I would definitely recommend this company and location however, it was all but perfect. We had a great time! 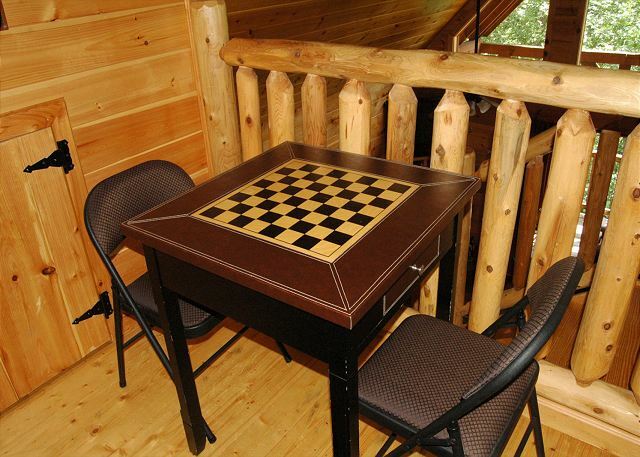 This cabin was excellent, especially the game room--the kids loved it! My husband and I decided on Pigeon Forge/Gatlinburg for our family vacation destination this year. We wanted a cabin in the woods and this is just what we were looking for! We had some unexpected visitors (raccoons!) the last 2 nights of our stay, even though we secured the trash bin outside. Those things are smart and sneaky! There are 2 cabins that are right by this one, which we didn't realize until we arrived. Our neighbors were pretty loud as their sound echoed in our direction, but we didn't hear them much after the first night since we were out most of the days. 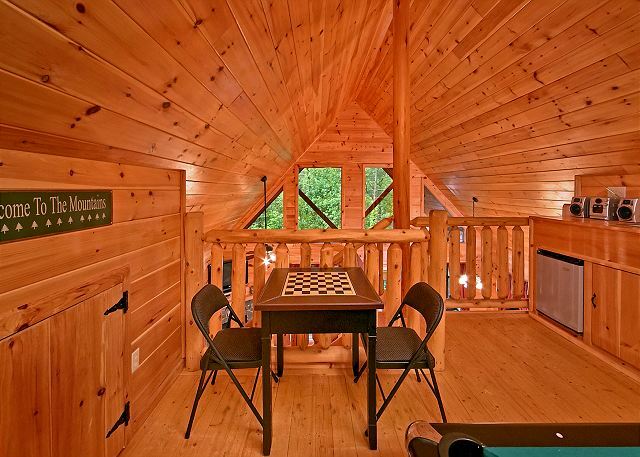 The cabin itself was exactly what was described on the site! 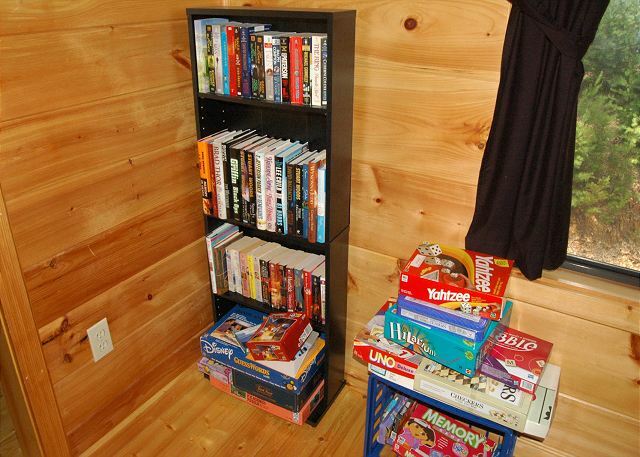 Everything was clean and orderly and the kids loved the upstairs game room and hot tub. The location was about 15 minutes from each Pigeon Forge and Gatlinburg. Will definitely use Aunt Bug's again!! Only a few issues. We weren't given alarm code so we had to wait outside of cabin while we were waiting on someone to give it to us over the phone. Our neighbors had potty mouths so the kids had to stay in the cabin a lot instead Of relaxing with us on the porch. The beds were a little firm. We had an overall good experience for our first time renting a cabin. The cabin was very clean! The staff was very nice. Great location. Would definately rent again! We enjoyed the cabin experience. It felt like home away from home. We had a great time at Bears Eye cabin. It was clean and everything we were looking for. The only thing I would have wanted is More Time to Stay! Overall the cabin was great and we had a great time. The internet connection will not run a laptop so was unable to use it. As a few other's stated the view is not very good from the over grown trees. My family and I had a great time and the cabin was clean and well kept, very relaxing. Rental staff was great. 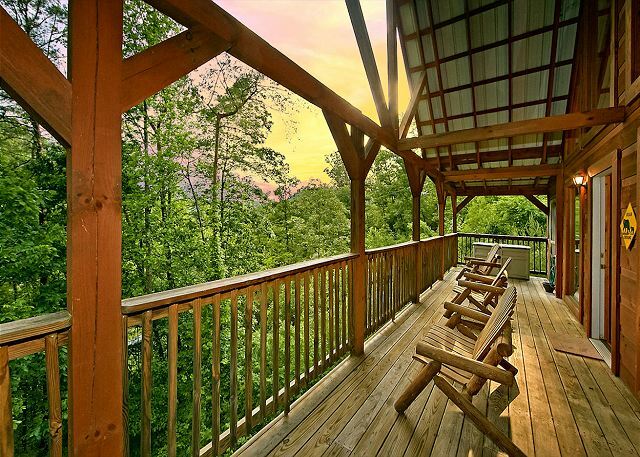 Great location with access to Pigeon Forge and Gatlinburg. Nice scenic drive to both towns. The cabin was spacious for our family of 5. It was very clean. 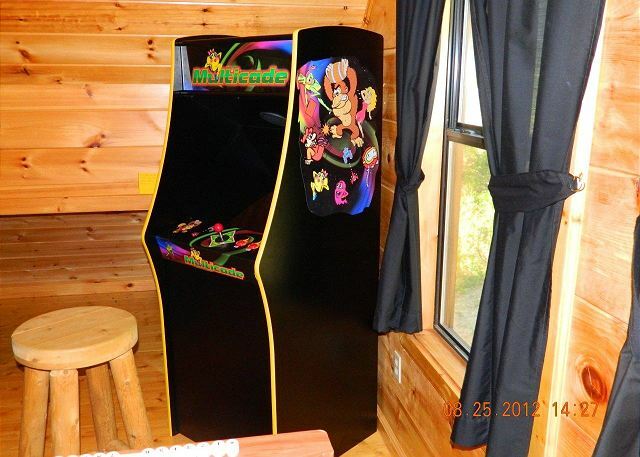 The gameroom was a hit with the kids, while my wife and I enjoyed the rockers on the porch. The staff was friendly and help full. The cabin was great and in a good location. We enjoyed the stay and scenery. It was very easy to find and notfar from pigeon forge or Gatlinburg.the roads to the cabin was not busywwith traffic and it was peace full. You must try out the cabins. 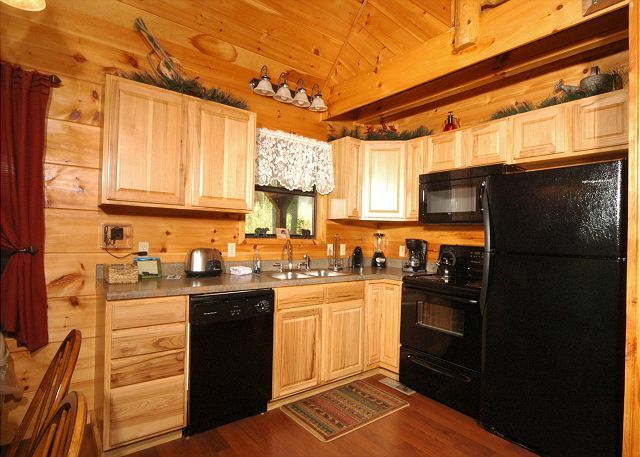 Cabin was very clean and the staff was very helpful from making the reservation to check out. 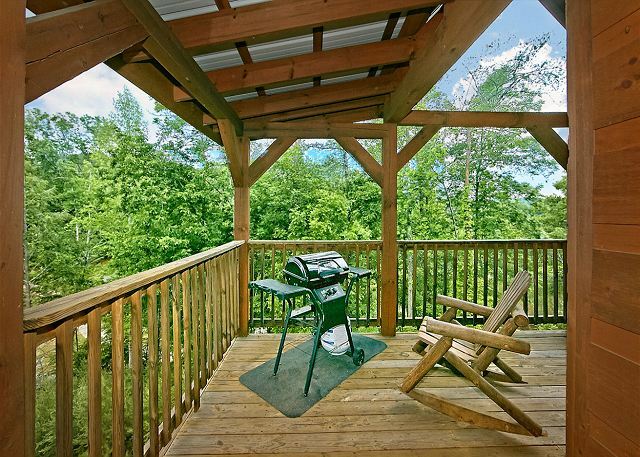 My husband and I wanted a quiet, secluded cabin with a view of the Smokymountains and that is exactly what we got. 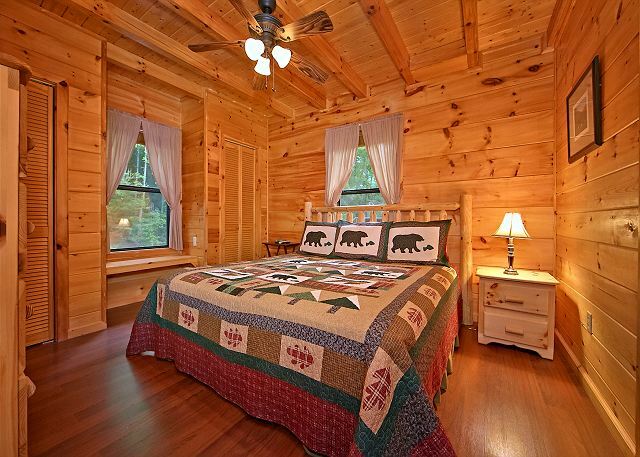 Loved the bear decor in the cabin. Would definitely stay there again. We had an awesome time at the cabin. It was everything it was supposed to be. 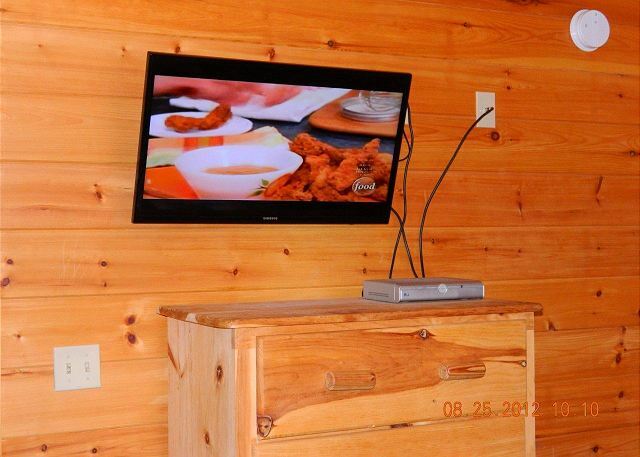 The pictures we saw online before arriving was just as the cabin really was. We enjoyed the view and the hot tub was nice also. Our cabin was so nice..." A Bear's Eye View"
We had more than enough of everything we needed. Cabin was very clean and well stocked. We had movies, lots of card games, CD's for the stereo, etc.. The hot tub had some issues that Aunt Bug's sent a repairman within 30 minutes. We had a blast! Driveway was a little steep! The location of the cabin is great. 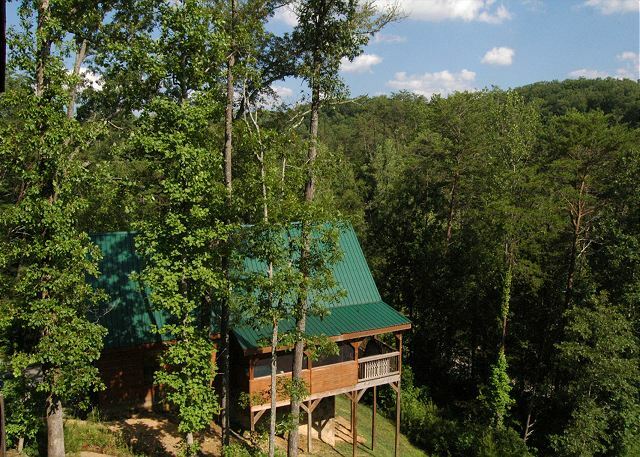 Slightly secluded, and not too far from Gatlinburg. Enjoyed sitting on the deck. Aunt Bug's was professional and nice to work with. 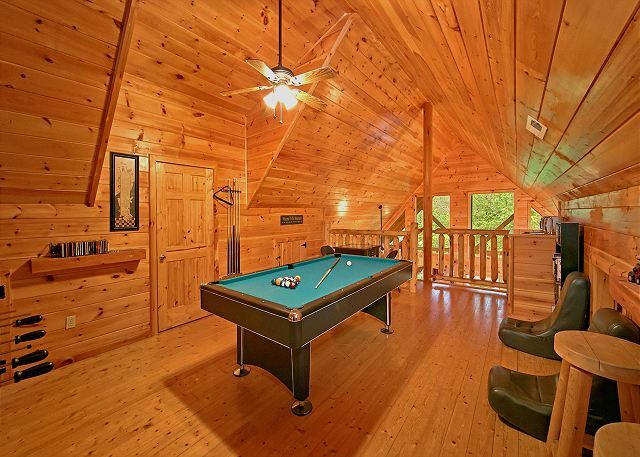 Beautiful, clean, relaxing cabin with fun game room! Very clean! Loved the wrap around porch and hot tub. Was surprised there was a couple cabins relatively next door on one side but owners have nice shades in hot tub area to help with privacy! It was a very peaceful romantic getaway! We would go back again in a heart beat! We had a great experience. The place and the setting was beautiful. Although the cabin seemed old and showed signs of wear and tear. Over all we had a great experience and would not mind going back to the same cabin again. Wish the cooking utensils was a little cleaner, the pizza pan was rusted and I wasn't going to go buy aluminum foil just to fix a pizza, if the cabinets was cleaned out it would be absolutely perfect, but I'd definately stay again. It was a great stay and would do it again when Tenn. Great view of the smokies. This is the first time I ever rented a vacation home and aunt bug's bears eye view did not disappoint. In fact the property exceeded my expectations. Everything was clean and looked exactly like how it was portrayed on the website pictures. The office staff were quite helpful and professional. This is one place I'll be coming back to and recommend to friends. Didn't have the view expected and could have done without some of the back roads, but overall, cabin was great, especially for kids. Very welcoming and attentive to client expectations. The cabin was lovely decorated and very clean. Will come back. Everything was great. The cabin was just liked the pictures. I spoke with Sarah and Courntey on the phone, and they were very polite. It was a great vacation. I will definitely be back! 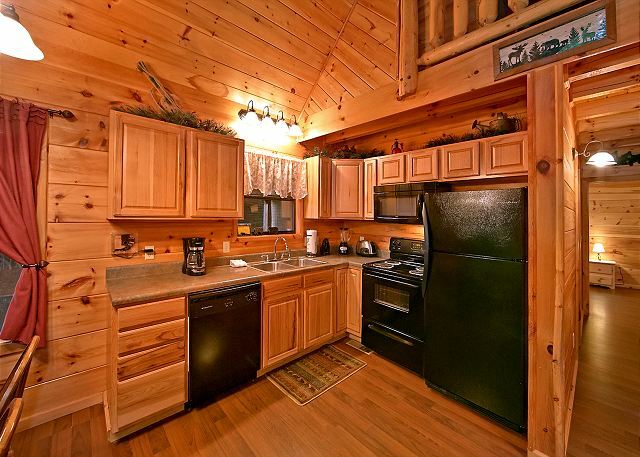 You are so friendly, accommodating, and extremely helpful for a first time cabin renter! You made our stay incredibly delightful! Thank you so very much! Easy checkout, cabin was very clean, need to let people know how steep the driveway is, it was just me and my two young kids luckily my SUV has 4x4 but I still had a mini heart attack the first time going up in the rain but besides that the stay was great, my 4 year old loved all the games and movies and we grilled both nights! Loved the stay! Quick and Easy Check In. Very Helpful and Courteous service. Cabin was ready for us when we arrived. Exceptional. We were very pleased. Clean, felt like we where at home. Very comfortable.. Great customer service. You guys where always available. Only thing we needed to do wgen we arrived was go to the grocery store.Hey this is Ebonie, I purchase some shoes from you back in March.I wanted to know if you do air force 1s or Jordans, I wanted to get some made for my older boys for school. I might need some shirts also, trying to see if you have any deals for me. Hit me back. Everything was in our cabin we needed. Thanks so much love it. The cabin was clean. We enjoyed the upstairs game room. The hot tub great too. Great experience. Staff was great! Cabin was exactly like description. It was a truly enjoyable, and relaxing trip to the mountains!! Everyone very professional and courteous. We liked the cabin itself but were very disappointed with the cleanliness. Curtains covered with dust, floor registers dust covered, all the bears dust covered, couch and rugs dirty, and all the windows were very dirty. There also was no view of the mountains, view blocked by trees. Hot tub smelled funny. Had a problem with the lock box upon leaving. Explained to agent when we called to leave. Excellent location and nice stay in the cabin. V courteous staff..
Everything was great. the cabin was exactly how it was in the picture. We loved the swans on the beds my daughter really got a kick out of that.. The place was neat and clean. We only had a few things that didn't work.. The radio upstairs we couldn't get the sound to work and the foosball table the leg was wabbly and it didn't have the things to catch the ball so we didn't even mess with it.. But our overall experience was GREAT!!! Everything was nice and warm. Tasteful decor. The driveway was a little intimidating for a flatlander but managable. The only negative was the dirty mattress on the pull out couch. 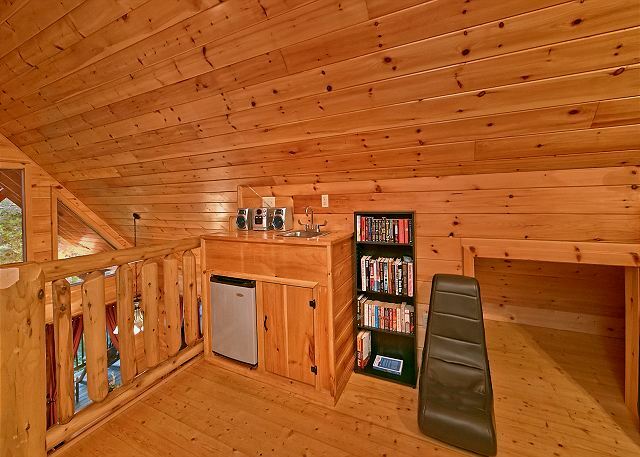 Other than that, a very nice cabin. The checking process was quick and easy and the young lady was incredibly nice. The cabin was perfect for our family of four. It was far more than we expected. Very clean and very accommodating. We have already decided that we would love to come back to "Bear's Eye View" again later this year. The driveway is a little spooky, but besides that, everything was absolutely fantastic! Highly recommend it to anyone wanting a nice quiet getaway. 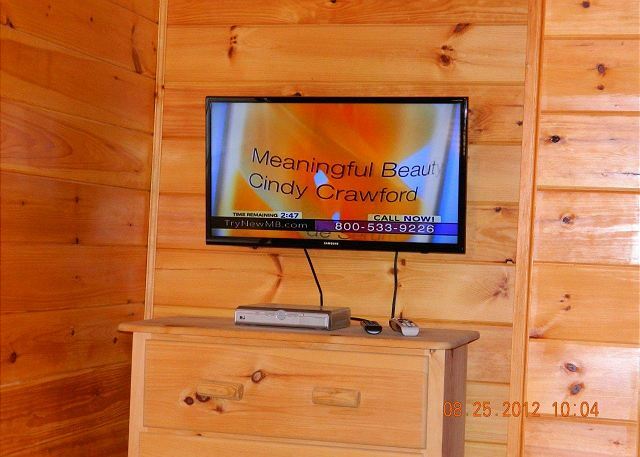 Our stay in A Bears Eye View Cabin was a wonderful experience. 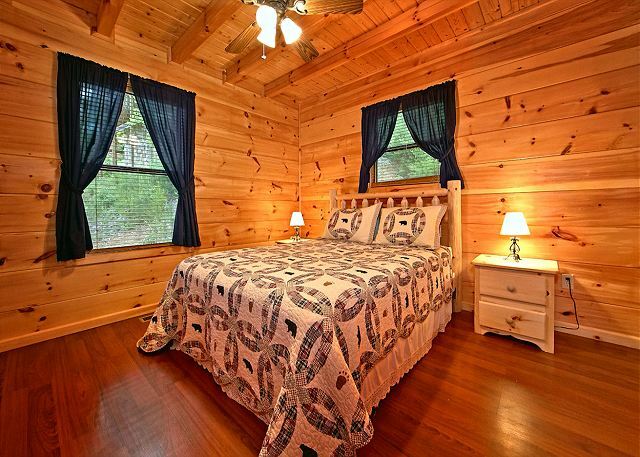 The cabin was just like home, very clean, beautifully decorated and the bed was very comfortable. Also, the pool table, games and videos made our stay even better. We will diffidently come back again. Everything was wonderful. Would have preferred not to have to go to the main office before going to the cabin. But it wasn't a huge deal. I was very happy with the location, place, setting, furniture etc everything. My kids enjoyed the games room and the ladies were happy with the kitchen. AWESOME!! Everything was great. We had a great time and can't wait to come back to Gatlinburg. Had A Great Time!! The cabin was very clean!! Relaxing!! Nice cabin, things were a little disorganized in terms of maintenance and housekeeping communication. Staff was friendly and helpful. Easy rental process. Good directions yo cabin. Clean cabin. Enjoyed our time. Only recommendation: driveway was very steep and had to use 4wd to get up it..may have mentioned this is description. Perfect location and ideal for our family of 5. 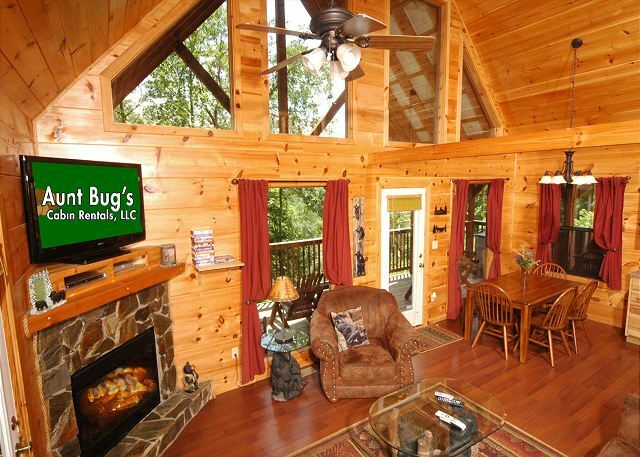 Great location between Pigeon Forge and Gatlinburg. The staff was friendly and helpful. The cabin was in great shape. My boys really enjoyed the game room. We will rent from you again in the future. Everything met or exceeded our expectations. Check-in and check-out process very simple. Cabin nice and clean. Overall very good experience. Check in couldn't be easier. Overall a very nice cabin and was ready for our arrival. We enjoyed the cabin and location. We had fun and enjoyed everything. We had a great time and the cabin really made the difference. It was clean and everything was what they said it would be. We couldnt me more pleased with the service and cabin. 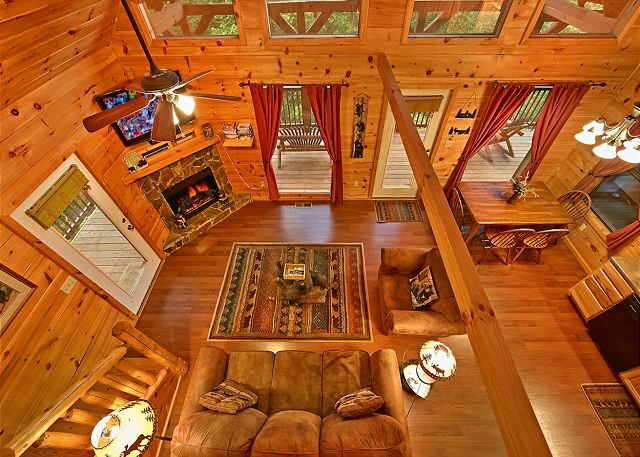 Clean, beautiful cabin. Everything worked well. Beds were comfortable. We enjoyed our stay. Thank you. Great! 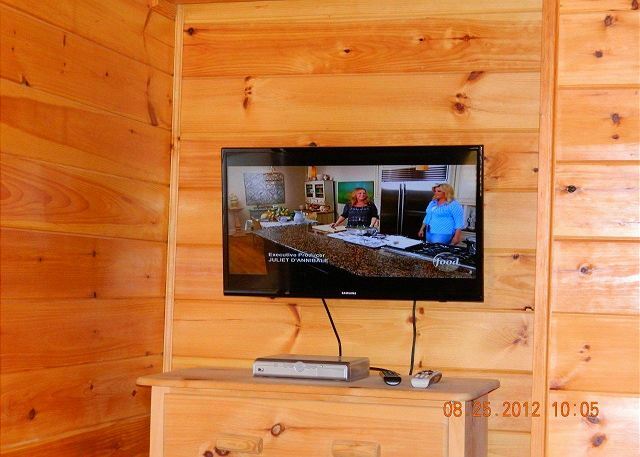 The cabin was all that it was advertised to be. I liked the cabin and local of it. we had stayed in that area before. Cabin was great. Steep driveway and narrow back roads were a bit scary but other than that we enjoyed our trip.